Although wetlands are often wet, a wetland might not be wet year-round. In fact, some of the most important wetlands are only seasonally wet. Wetlands are the link between the land and the water. They are transition zones where the flow of water, the cycling of nutrients, and the energy of the sun meet to produce a unique ecosystem characterized by hydrology, soils, and vegetation – making these areas very important features of a watershed. Using a watershed-based approach to wetland protection ensures that the whole system, including land, air, and water resources, is protected. Wetlands found in the United States fall into four general categories – marshes, swamps, bogs, and fens. Marshes are wetlands dominated by soft-stemmed vegetation, while swamps have mostly woody plants. Bogs are freshwater wetlands, often formed in old glacial lakes, characterized by spongy peat deposits, evergreen trees and shrubs, and a floor covered by a thick carpet of sphagnum moss. Fens are freshwater peat-forming wetlands covered mostly by grasses, sedges, reeds, and wildflowers. Often called “nurseries of life,” wetlands provide habitat for thousands of species of aquatic and terrestrial plants and animals. Although wetlands are best known for being home to water lilies, turtles, frogs, snakes, alligators, and crocodiles, they also provide important habitat for waterfowl, fish, and mammals. Migrating birds use wetlands to rest and feed during their cross-continental journeys and as nesting sites when they are at home. As a result, wetland loss has a serious impact on these species. Habitat degradation since the 1970s has been a leading cause of species extinction. Wetlands do more than provide habitat for plants and animals in the watershed. When rivers overflow, wetlands help to absorb and slow floodwaters. This ability to control floods can alleviate property damage and loss and can even save lives. Wetlands also absorb excess nutrients, sediment, and other pollutants before they reach rivers, lakes, and other water bodies. They are great spots for fishing, canoeing, hiking, and bird-watching, and they make wonderful outdoor classrooms for people of all ages. Despite all the benefits provided by wetlands, the United States loses about 60,000 acres of wetlands each year. The very runoff that wetlands help to clean can overload and contaminate these fragile ecosystems. In addition, nonnative species of plants and animals and global climate change contribute to wetland loss and degradation. In addition to providing regulatory protection for wetlands, federal government agencies work in partnership with states, tribes, and local governments, the private sector, and citizen organizations to monitor, protect, and restore these valuable habitats. First, identify your watershed and find the wetlands in your neighborhood. Learn more about them and share what you learn with someone you know! Encourage neighbors, developers, and state and local governments to protect the functions and values of wetlands in your watershed. Participate in a volunteer wetland monitoring program. Support your local watershed association. Plan a wetland program or invite a wetland expert to speak at your school, club, youth group, or professional organization. Invest in wetlands by buying duck stamps. Proceeds from these $15 migratory bird hunting stamps support wetland acquisition and restoration. The stamps are available online at the U.S. 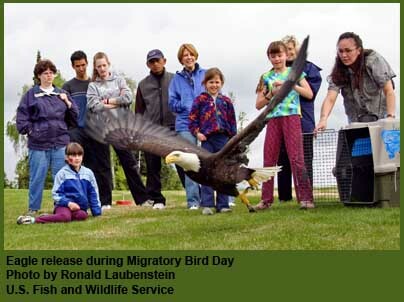 Fish and Wildlife Service’s web site (www.fws.gov) or at your local post office. Instead of draining or filling wetlands, find more compatible uses, such as waterfowl and wildlife habitat. When developing your landscaping plan, keep wetlands in mind. Plant native grasses or forested buffer strips along wetlands on your property to protect water quality. Plan to avoid wetlands when developing or improving a site. Get technical assistance from your state environmental agency before you alter a wetland. Maintain wetlands and adjacent buffer strips as open space. Build a wetland in your backyard. Learn how by visiting the U.S. Department of Agriculture’s web site at http://www.nrcs.usda.gov/wps/portal/nrcs/detail/national/newsroom/features/?cid=nrcs143_023525. CLICK HERE for more ways to help wetlands.